Favorite activity Likes to eat. Favorite toy A clear plastic ball. 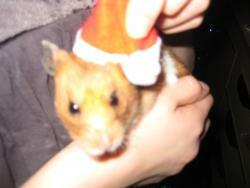 Story Boo is a brown and white Syrian hamster. She is very kind and nice. She likes cuddles and strokes but Boo especially enjoys rolling about in her ball.